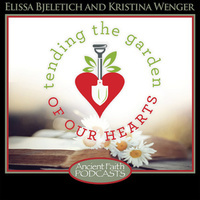 Tending The Garden: Why Tend The Garden of our Hearts? Why are we tending the garden of our hearts? What do the Saints tell us, and how can this idea help us in our own spiritual lives? Kristina Wenger and Elissa Bjeletich consider the Magi: who were these wise men from the East, and what made them decide to seek out the Baby Jesus? Elissa and Kristina discuss the upcoming feast of the Theophany, the Baptism of our Lord Jesus Christ in the Jordan River.